The optimist: I see Alzheimer’s has lifted any weight she bore in this life. She is unfettered and living life in the here and now. There is no past, no future worries on her mind–after all, worry is fretting over what might be. The woman once propelled by a bit of useful OCD, kept a lovely, impeccably neat home; but she is now free of that. She’s free of extra hours spent primping with hair and make-up; taking care to uphold the classic, ivy-league style that was her brand. I accept whatever goodness lies in this Alzheimer’s experience I share with her. It’s touched us all. She’s taught me to relinquish control and age with abandon. When the time comes, cooperatively submit yourself to the care of others. Most of all live in the moment; let God’s will be done. 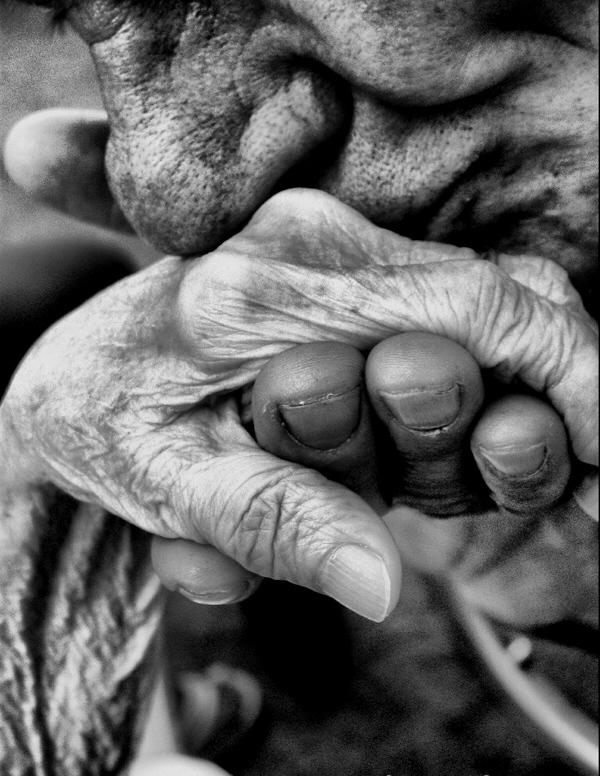 The pessimist: I cower watching Alzheimer’s, slowly devour her. Fearful partly because I know that this horrible monster lurks trapped within our genes; partly because as a predator it has not yet culled my thoughts from where they reside. I’m ever mindful of its shadow…it looms over me…a trapped mouse. Through these small, black eyes, behind these close-knit bars, I witness her in its grasp. She’s completely isolated in her demise as it sears off the last bit of fluffy, grey matter floating beneath the grey whisps left covering her head. Perhaps she doesn’t know that she is gone. The pragmatist: I resolve not to live in fear, brace myself for what might come, and I write about what will be simply forgotten. Fascinating perspectives that portray this disease so accurately. As I watched my mother’s slow progressive transitions, all of these thoughts were present as I learned to treasure each moment I do have as a pragmatist, not only writing but sharing love and building memories for the next generations. Thanks for sharing this, Carol. My aunt died this past fall, 2015. I’m still sorting out my feelings about her life and death–in the end, this will no doubt manifest in more writings. Bless your mom, my aunt, and all of us who have experienced this disease directly or indirectly. As Carol said, thank you for sharing this, Kennedy. It is so powerful, moving, and thought-provoking. Thanks Alyssa. I am just as moved by your posts. They represent the other side of my life (children), the side that I hope will continue long after me in good health. This is such a great perspective of an unfortunate disease. There are always two sides of the coin, one of them more hopeful than the other while the other side is a more realisitic view of things to come. I think often when we’re in such a situation, we flit through both perspectives unknowingly. Good observation, Mabel. “We flit through both…” which is why I think writing helps the writer and reader sort through and identify those often tangled-up feelings. It’s mutually cathartic.